This is the ninth page of Shinpan kaisei, Kosen nedantsuke, Narabi ni bantsuki (Improved New Edition: Price List of Old Coins, Together with Rarity Ranking), printed in the city of Nagoya in 1799. This book belongs to the collector Sam Leung who kindly provided me with the images and allowed me to present these at my site here. This page starts with Japanese charms and then presents a range of coins from all over East Asia. 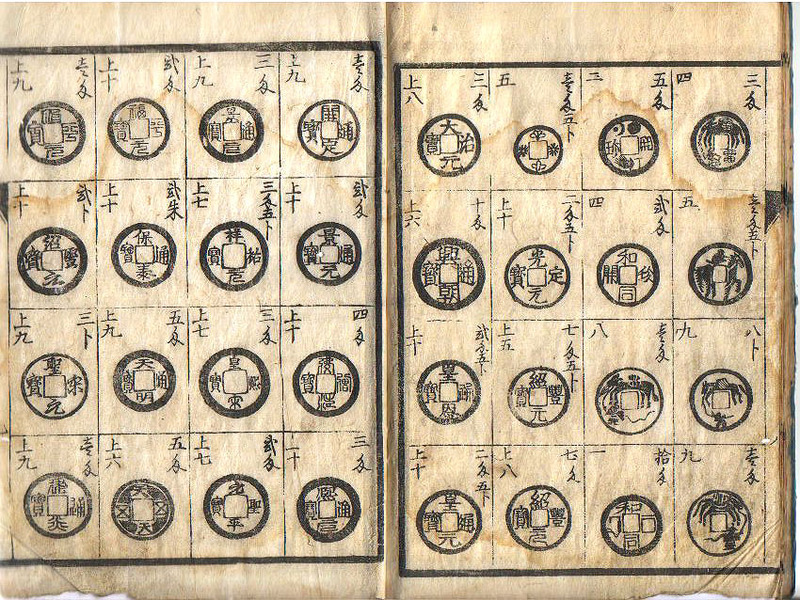 the top left coin is a medieval Japanese "bitasen" or unofficial mint coin. It is called a Junpei genpou. This one has a retouched outer rim. I have one without a retouched outer rim on my bitasen page.